Imagine going to a nice dinner out with your family. All the people closest to you are there even your 90 year old grandmother. You are enjoying the ride home in the car only to suddenly realize you left the camera bag in the restaurant. You race back to see if it is still hanging there on the back of the chair. Your heart drops as you see that the bag is gone. Nobody from the restaurant has seen it either. It’s gone. The camera and 5 years of memories because you never took the photos off the card. Unthinkable? No so. I personally know of a dozen people that never bother to take the images or video off the camera or phone. 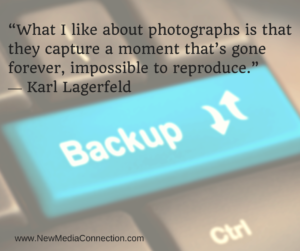 With most of us capturing moments on our phone these days are you taking the time to move those images and videos off to your computer or to the Cloud? Here are some ways to preserve those memories. Internal Hard Drive: Simply use your operating system to transfer the files to your computer. In both Windows and Mac OS an automatic popup window will guide you through transferring the files. 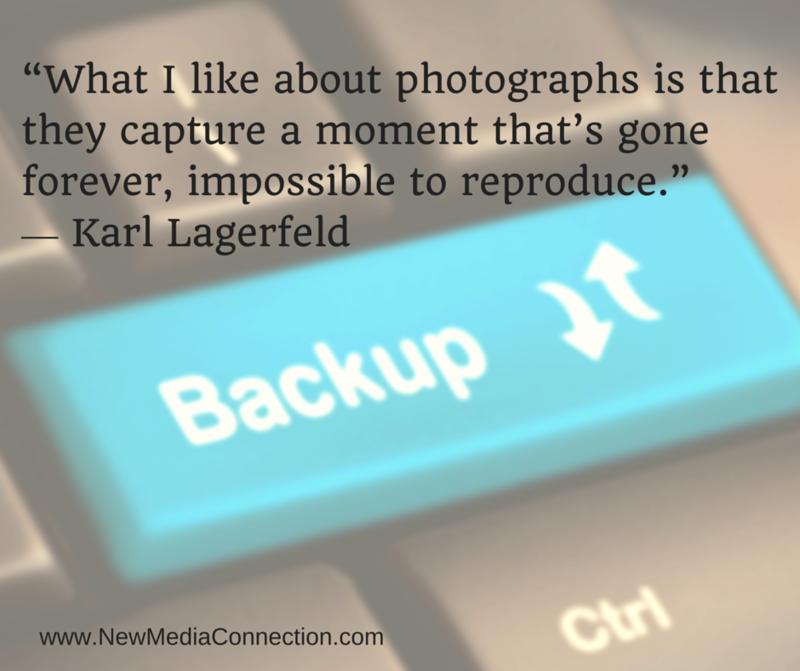 Just attach your camera or phone and use the backup function to transfer those files. External Hard Drive: Buy an external drive and plug it in to your computer and simply drag and drop your image files from your card to the appropriate folder. Cloud storage: Services like iCloud, Dropbox or Google Drive will give you free storage to store your images and video. I use Google+ which is attached to my Google Drive account to automatically backup images and video clips that I take with my iPhone. As soon as I am connected to Wifi the images just start uploading in the background. The best part of this service is that if you choose standard resolution to upload the images Google will give you an unlimited amount of storage. Given how inexpensive storage is these days there is no excuse to not transfer and backup those irreplaceable files. Trust me you never want to experience the loss of data that could have easily been backed up.